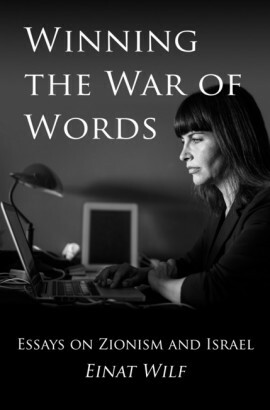 Einat Wilf’s book Winning the War of Words: Essays on Zionism and Israel is available on Amazon or to download as a PDF. One problem for anyone trying to offer a defence of Israel in the face of the determined intellectual assault on the country in recent years is that while the assault is simple and easily understood – conducted in an adolescent emoji language of epithets and images – the defence is harder to explain. To defame the country one merely needs to say ‘colonialism’ or ‘apartheid’, and add a photo of a soldier manhandling a child. To defend Israel requires an understanding of at least 100 years of history in both Europe and the Middle East, of how we reached this moment, and of what Israel’s choices really are right now. Anyone trying to explain Israel’s case needs to be worldly enough to make sense to people outside the bubble of those who are reflexively sympathetic to Israel anyway, and it helps not to be ideologically rigid or so angry you can’t speak calmly. In the collection Winning the War of Words, Wilf presents essays and articles that look at Israel, at the political offensive against Israel, and at the country’s place in the growing violence that surrounds it in the Middle East. Together, the pieces offer a thoughtful take on Israel’s current trials, and a spirited defence of the country’s basic rights in the face of the bizarre, fashionable, and growing international hostility to the state on 0.01 per cent of the world’s surface whose activities and very existence seems to be an affront to so many. Things move so far so fast in this region that some of the pieces here already seem like distant history just a year or two after being written. If Iran, Wilf wrote in 2013 as the nuclear negotiations progressed, ‘felt that the economic pressure and the credible threat of military intervention were to threaten its very survival, it might, just as Assad did with the chemical weapons, go as far as give up the entire nuclear program altogether.’ Ah, 2013 – it was an innocent time. Of course we know now that the West will never make such a threat, that the mullahs will have their way, and that the Americans are in retreat amid the confused ruins of their policies as the Russians move in. The correct course for Israel amid all of this, Wilf believes, is scrupulous neutrality: not to intervene but instead to dig in and wait it out. ‘Switzerland managed to survive and prosper as a “neutral bunker” while Europe was torn apart by religious, sectarian, civil, national and world wars,’ she points out (though conceding that Israel lacks some of Switzerland’s assets, chiefly the Alps). Indeed, the country’s future currently depends on our ability to keep out the violence that is destroying the Islamic world around us, and Wilf’s bunker analogy is apt. Our bunker, however, isn’t particularly well-constructed, and it’s an open question how deep we can really dig in: the spate of Palestinian stabbing attacks on our streets in recent weeks have reminded us that there are enemies inside the bunker, and of course Hamas rockets have shown that we don’t have much of a roof. In the articles dealing with Israel’s manoeuvrings with the Palestinians, Wilf devotes attention to the UN’s agency for Palestinian refugees (UNRWA) which she describes as one of the key drivers of the conflict. This international body has ensured, she writes, that instead of being absorbed in their host countries Palestinian refugees have not only been maintained as refugees for seven decades but have been multiplied many times over as a political weapon against Israel. ‘Whereas the actual number of Arabs who could still claim to be refugees as a result of the Arab-Israeli war of 1947-1949 is today no more than several tens of thousands’, Wilf informs us, ‘the number of those registered as refugees is reaching five million, with millions more claiming to have that status.’ In a different essay, written with Shany Mor, she analyzes the history of the territory called Palestine and urges Palestinians and their international supporters to specify exactly which ‘Palestine’ they support – ‘liberation Palestine’ or ‘elimination Palestine’, that is, a state alongside Israel or a state instead of Israel. That analysis, with which I must agree, is why I have my doubts about another of Wilf’s observations about intellectual efforts on behalf of Israel: ‘while victory in this battle, as in others, is not likely to be swift, with the proper resources, organization, and determination it is within reach.’ I don’t think this is the case, just as I don’t think that eloquent explanations in the 1920s could have convinced Germans that Jewish bankers were not manipulating the financial markets for their own devious gain, or that skilful essays or speeches could have countered the idea in capitalist countries that Bolshevism was a Jewish plot. No ‘war of words’, however skilful, can defeat the anti-Jewish obsession that crops up with unfortunate regularity in world history, of which today’s anti-Israel fixation is merely the most recent incarnation. Explanations of Israel’s complexities in the real world will have a limited effect not just because they are necessarily complicated, but because the Israel obsession – in the manner of obsessions – isn’t really about Israel at all, or about the real world. These pathologies can perhaps be tempered on the margins but cannot be made to go away. An involvement with the Jewish state ‘is not for the fainthearted,’ Wilf writes: the country never promised to make it easy for anyone and indeed has never done so, like ‘a high-maintenance girlfriend,’ at once impossible and irresistible. ‘In return for never-ending efforts to woo her, not a trace of gratitude is to be offered – barely an appreciative smile.’ Wilf seems tough enough to keep it up nonetheless. Her efforts are crucial, and there is no reason to expect them to be less necessary or easier anytime soon. As she noted in a talk she gave in London last (2014) year, quite possibly the major stumbling block to any settlement of “the problem” is that not even young Palestinians are prepared to recognise the Jews as “a people”, because to do so would mean accepting that they are, therefore, entitled to self-determination: a state to call their own. And, she continued, this is what he means when Netanyahu says that there won’t be a two-state solution in his lifetime: it will take that long for a generation to come along willing to accept the Jews as a people.